Take your viewing entertainment to another level when you purchase the ASUS 16 in. Class Portable LCD monitor. This 16 in. LCD monitor ensures an exceptional viewing experience as it produces stunning visuals in 1366 x 768�maximum resolution. Featuring a contrast ratio of 500:1, this portable LCD monitor delivers sharp and vivid images with darker blacks and brighter whites. It also means that it produces visuals with balanced display of colors and details. Plus, it includes USB 3.0 port, which you can use to connect compatible peripherals, ensuring high speed connectivity. 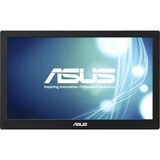 Purchase the amazing ASUS 16 in. Class Portable LCD monitor today! Auto-rotating display bundled with the ASUS Smart Case - a two-way adjustable stand and protective sleeve.